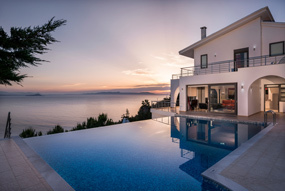 A modern villa with pool and jacuzzi, built on a 50000sq.m coastal private property with breathtaking view and private access to the sea. A sea side villa with private pool, indescribable sea view, modern decoration and equipped with all the necessary amenities to offer you a luxury stay. A lovely light and airy new-built villa for 10, with large private pool and garden, located in a beautiful traditional village, ideal for relaxing vacation away from the city noise. A beautiful furnished restored villa, located in a peaceful area only 600m from the beach, with private pool / jacuzzi, Turkish bath and pool house. A new built sunlit villa with private pool and panoramic, unobstructed view over the green landscape, the sea and the distant mountains. A historic villa built in 1866, renovated and decorated to the traditional Cretan style, only 700m away from the village and the long Maleme beach. A new-built, tastefully decorated traditional villa, with private pool and garden, built on a slope of a hill, offering beautiful panoramic views. A peaceful villa with private pool and wonderful view over the impressive Kournas Lake, the Georgioupolis bay and the valley. A stone villa located at the entrance of Souda Bay, just 250m away from the sandy beach and less than 1km away from Kalyves village.